Tolkien Inspiration: The Ring Verse ... in 59 languages! The Ring Verse ... in 59 languages! Some months ago, I had the great of idea of translating the Ring Verse in most number of languages possible. For this I started to ask some friends to translate the Verse of the Rings in their native tongue. After a few days, I thought that maybe someone had had this idea already, so when I did a search on the web, I came upon several sites that offer many translations! The first one I discovered was Elrond's Library, a site of a Tolkien collectionist, Yvan Strelzyk. His site offers translations of this verse into 49 languages, and sometimes with different versions of the same language. Most jpg files in this post are from his site, don't hesitate checking it! I will cite translations from this webpage as EL. Another site with many translations is a polish site, http://www.lodz.tpsa.pl/bez/Tolkien/vers-eng.html, Gwidon S. Naskrent is the author of that article. 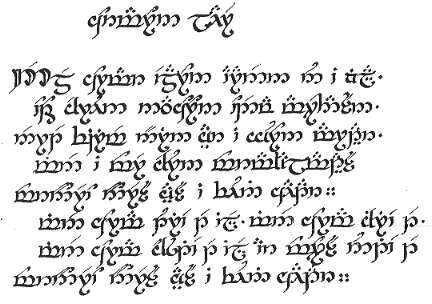 It has the Verse in 33 languages, some of which don't appear in the Elrond's Library site, including Sindarin. I will cite translations from this webpage as GN. Regarding Quenya translations, I found two:the Elvish.org one (EV), translated by Maciej Garbowski, and the one of Ambar Eldaron (AE). Elvish.org also has a different Sindarin version given by Ryszard Derdzinski. Finally, before I post them all, I also found two Old English translations: the one by Freya Harrison (FH) and the one by Carl Anderson (CA). Edit: recently I have added translations in four new languages: Tagalog, Quechua, Delang and Slovak, and additional translations in Frisian and Russian. ін δетелј ƕҩłи δенyьт політіьі. Sep por la dvarvo-moshtoj, en haloj de shton'. En la lando Mordor, tenebra pro malhelo. Trije Ringen foar de Alve-kenings, wolk-dutsen en heech-eal. Sân foar it Ierdmans-folk yn harren stiennen seal. Njoggen foar Stjerlingen, ta de dea ferwiisd. yn Mordor, oerskade en feal. oan Mordor, oerskade en feal. naoi gcinn do dhaoine básmhaire atá faoi cháineadh an éag. i dtír Mordor a bhfagraíonn na scáileanna. en Dír Mordhor pémái lía in 'cáthé. In thamma landa Maurdauris tharei thai skadjus ligand. Ain figgragulth briggan ija alla jah in riqiza bindan ija. Nella Terra di Mordor, dove l'Ombra cupa scende. Mordore terra illa, qua sunt caliginis umbrae. þér licgað scedwa in londe Mordores. Notemug has uploaded a video reading this version of the verse! in westnesse mordores fæste forbræded. Kinsa siwikuna hanaqpacha ukhupi Elfo Inkakunapaq. Qanchis rumi pukarakunapi Huch’uy Wiraquchakunapaq. Isqun wañuyman qinchasqa Wañuq Runakunapaq. haqay llanthuq kamaynin Mordor Llaqtapi. Huk siwi llapanku kamachinapaq. Huk siwi llapanku tarinapaq. Huk siwi llapanku qayllachimunapaq hinasqa tutaman watarunapaq. Mornórëo Nóressë yassë i Fuini caitar. Nóressë Mordoro yassë caitar i Lómini. Arkxyz has uploaded a video of she reading the poem, be sure to listen to it! Vi Dor e-Mordor ias i-Ndúath caedar. Un Anillo para gobernarlos a todos. Un Anillo para encontrarlos. i Mordors land, där skuggorna ruva. Doon sa lupalop ng Mordor na kinapupugaran ng mga anino. a la Terra de Mordor, a on s'estenen les Ombres. a la terra de Mordor a on s'estenen les Ombres. If you see a mistake or your language is missing, please contact me! Thank you, I appreciate your feedback! :D Someday I'll make my own Quenya translation! Thank you a lot, Mithrennaith! I have updated the post with your valuable information! in the land where the night rules. Thanks a lot! Honestly I did not know what Delang was, but now that I have read about it, I find it extremely interesting! Cheers! Fantastic! Thanks a lot, Thalen, I have now added Slovak to the list! The Ring Verse is in 58 languages now. v zemi zvanej Mordor, kde šero so šerom sa snúbi. Jeden všetkých privedie, do temnoty pozväzuje. Awesome, thank you very much indeed! I have provided a link of your site too, in the credits! I can't believe that there isn't a Welsh or Gaelic version! And it'd be a challenge to post, but an ASL version would be neat. 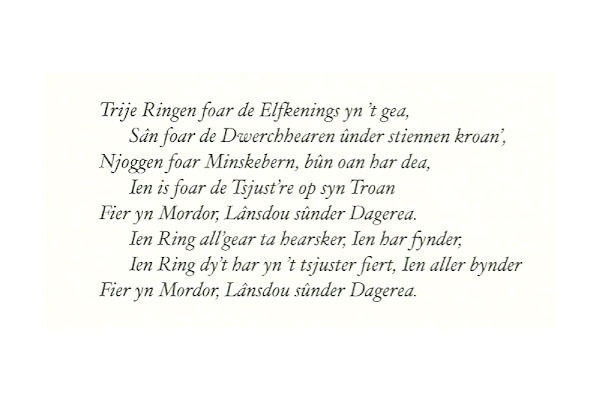 I was wondering what the rest of the poem would be in the Black Speech of Mordor, the language it would apparently have been composed in. We've seen the last three lines written around the ring for several decades now, but nothing of the ones coming before. Seizh d’an Aotroneż-korrigan ’n o falesioù-mein. E Bro Mordor, e skeud an disc’holoù. Here is the Korean version. I have a Chinese calligraphy competition tomorrow and have been looking for something nerdy to write. Thank you for the inspiration. Click here to see all of our exclusive deals on Buna O-ring. Get the best prices on Buna O-ring today. We are leading Manufacturers and suppliers of all type of O-Rings Seals and Gaskets. Check out our exclusive deals right now. Christopher Tolkien's interview to "Le Monde"